Welcome back! 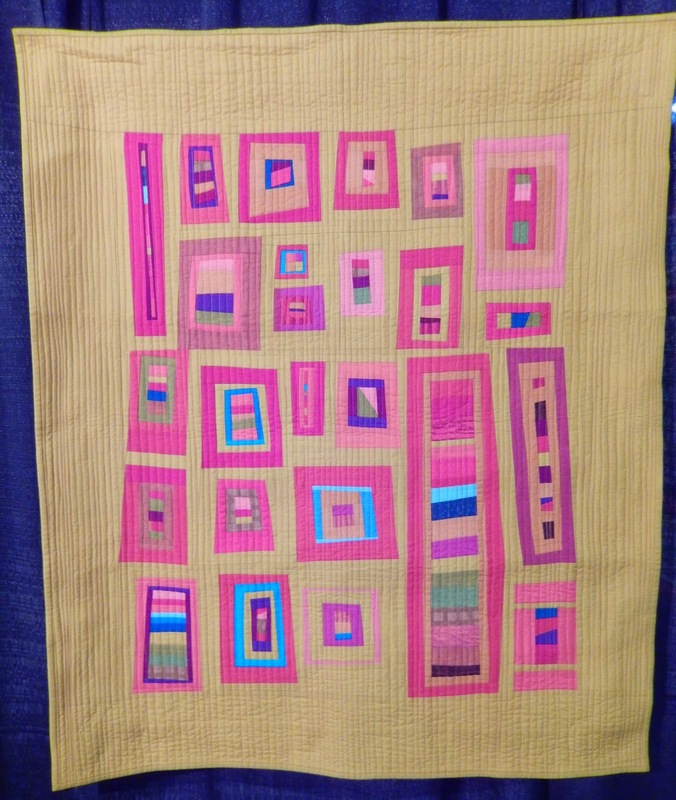 More wonderful quilts and their accompanying descriptions from the Modern Quilt Guild Showcase in Houston, TX follow. If you missed my first post, you may want to check it out. I have long been fascinated by tessellation's, especially Escher's work. This is a piece based on a traditional Chines porcelain design, but I wanted to disrupt the orderliness and infuse the quilt with energy. I did this by changing up the colors, and the stitching naturally flowed from that design choice. "A pixel is the smallest component unit of any digital image. As a photographer, I began thinking of quilts in the same way by breaking a classic Four Patch block into its base component, the square. Rather than manipulate the pixels into a recognizable image, I amused myself with the interplay of light and dark to create movement." This quilt started as a turquoise pieced top that I hated. I cut it up and sewed it back together seven times, and took it out of the garbage at least twice. In the course of this quilt's life, it has been cut down from a 60" square, appliquéd, un-appliqued, and has had white borders, and has hd pieced borders. This final layout was inspired by a quilt I saw at a show about 20 years ago. I don't know the name of that quilt's maker, but never forgot her giant Drunkard's Path blocks and large-stitch quilting. I've decided that it is now finally acceptable and I quite like it. This quilt was inspired by the colors of New Mexico. I created each improvisational block as if it were looking out a window. imagined rolling hills with the sea i the distance, flower fields and sunsets. The simple straight-line quilting enhances the vertical nature of the windows. I made this quilt for the Seattle Modern Quilt Binary Challenge in which we were challenged to make two-color quilts. 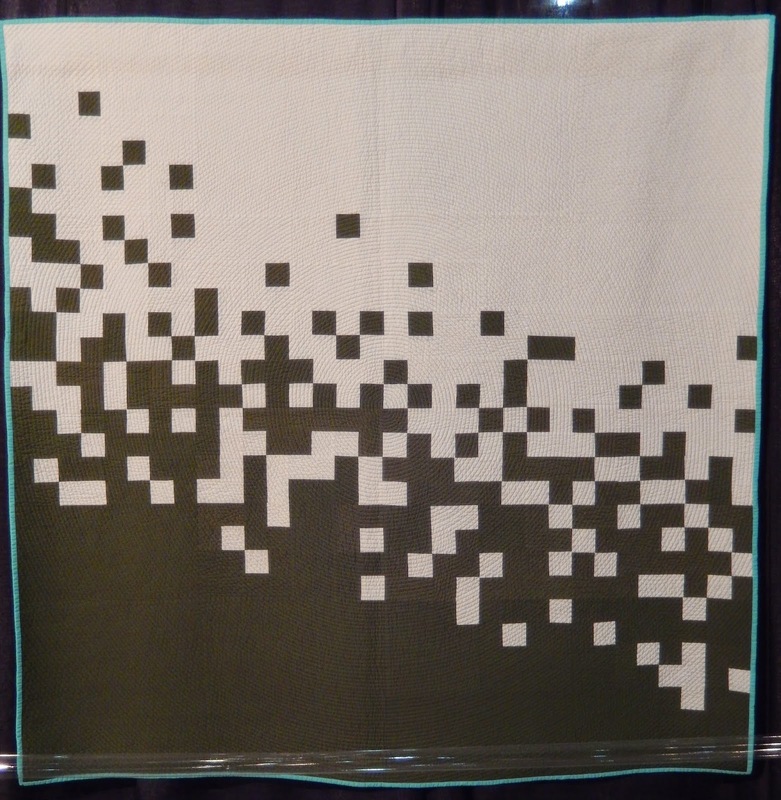 An e-mail ad wit hanna Albers' designs led me to explore her textiles and designs. 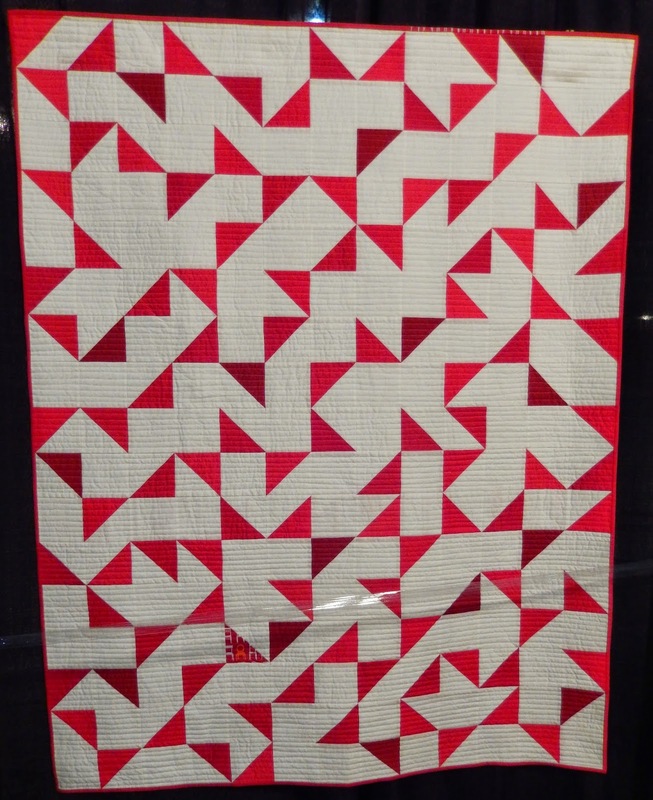 Her graphic and linear sensibility inspired this quilt using red and white Half-Square Triangle blocks in a non-traditional setting with irregular negative space. A maverick orange chair block found itself in the quilt. This quilt was designed for a very special person, whose name inspired the whole quilt, from the colors selected to the design and quilting. Originally titled 50 Shades of Grayson, the title was modified to something a bit more comfortable. 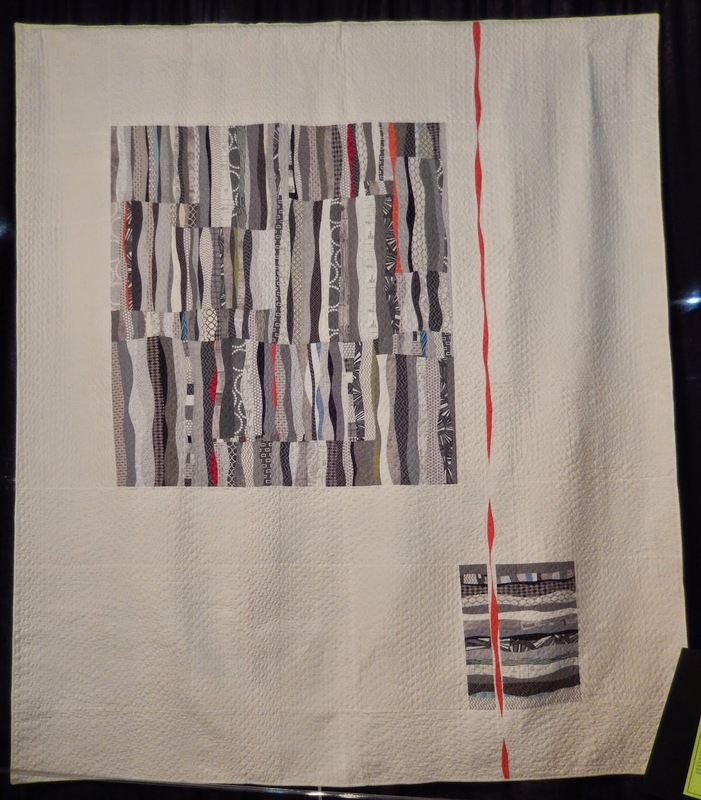 The quilt is pieced in many shades of gray fabric with punctuations of the recipient's favorite colors. 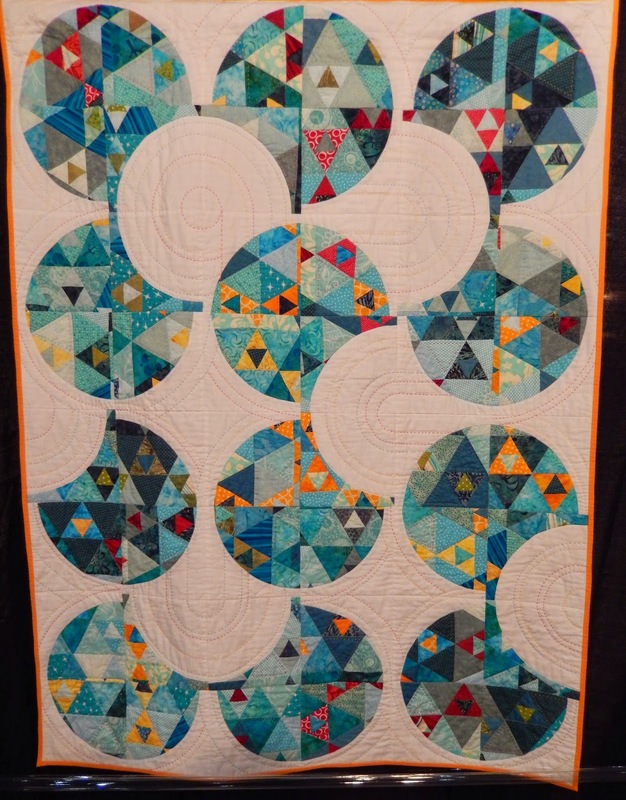 The quilting reflects the piecing and connects the larger areas of negative space. Wow they are all incredible, especially Disruption - I love the way it plays with ŷour vision! Thank you for sharing! These quilts are amazing. I really love Fade into Gray in this series.